Anti-caking Agent: Mix in animal feeds not to exceed 2% by weight of total ration. 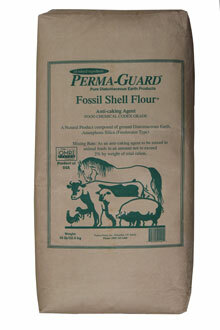 We purchase Perma-Guard FOSSIL SHELL FLOUR® Diatomaceous Earth and package into Root Naturally Brand retail sizes. The following information is in reference to the Diatomaceous Earth we use in our products. This information is from the Perma-Guard website. Perma-Guard, with more than 40 years of experience, is the company known world wide for using a grade and quality of Diatomaceous Earth that is extremely pure. Out of 600 deposits in the US only 4 are considered "Food Grade" by the FDA standards. Other food grade deposits may contain higher amounts of sediment and clay that make them less effective. Depending upon how the deposits were formed, clay particles may be present in sufficient quantities to clog the pores of the fossilized shells. If this is the case, the effectiveness of the Diatomaceous Earth is severely reduced. We have analysis of many other "Food Grade" deposits and are satisfied that we still obtain the Diatomaceous Earth for our products from the purest fresh water source. FOSSIL SHELL FLOUR® is almost pure white and consists of 89% (and sometimes more) Silicon Dioxide plus 28 trace minerals which means more diatom surface area is available. More diatom area means greater absorptive capacity and more improvement in the mixability and flowability of animal feed. FOSSIL SHELL FLOUR® does not swell, does not absorb nutrients and poses no long term hazard when used as an anti-caking agent in your animal's feed. Why fresh water vs. salt water Diatomaceous Earth? Fresh water deposits like ours have a consistent diatom presence. Their fossilized shells have maintained their tubular shape. This shape and strength of the fossil shell is critical to its effectiveness. Our deposit has 89 - 95 percent amorphous silica content. This deposit is also more consistent in its purity of other elements that have settled in it. A fresh water deposit is confined to the run off water of its surrounding environment. A fresh water deposit in the mountains, such as ours, formed when snow was pure and its run off provided the water source these diatoms lived in. Salt water deposits contain a mix of types of diatoms of different shapes. Their fossilized shells are fragile and break easily. This renders them ineffective for our purposes. The salt water deposits are less predictable in their sediments. What's the difference between amorphous and crystalline silica? Amorphous silica is silica in its natural occurring state. It is a trace mineral every mammal on the planet needs to live. It becomes crystalline when it is exposed to extreme heat through volcanic activity or commercial manufacturing means. The type of Diatomaceous Earth used in swimming pool, and other, filtration systems is crystalline silica. Crystalline silica is extremely dangerous when inhaled or ingested. It is not biodegradable. Perma-Guard Diatomaceous Earth contains less than one half of 1% of crystalline silica and is considered GRAS (generally regarded as safe). Bird and animal feed contain substances such as molasses that cause the particles to become "sticky." It forms clumps that not only make the feed hard to pour, but also to become moldy. FOSSIL SHELL FLOUR®, mixed in the feed, coats each particle making it difficult for the particles to stick together. This allows the feed to "flow" better and its absorption ability protects it from mold. No mold means less wasted feed. By separating the particles of feed, the animal's digestive enzymes are able to completely surround each particle.